I am such a huge fan of one-pot meals. They are wonderfully quick + easy to come together, you don’t need to be juggling 4 different pots/pans over the stovetop, and there is (HOORAY!) only one pot to clean up at the end. 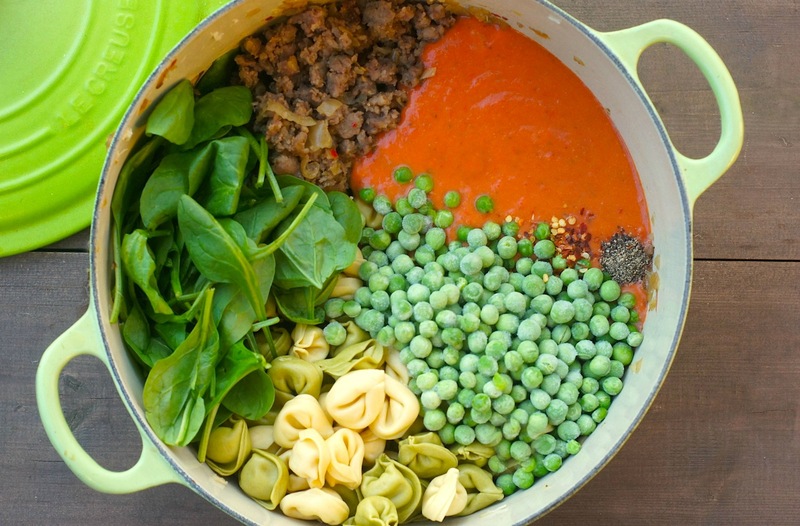 My One-Pot Tomato, Basil + Chicken Pasta is now one of my most popular blog recipes, so I thought it was high time to share another one-pot wonder with you: This awesome One-Pot Tortellini with Sausage, Spinach, + Peas. And one final bonus, if I haven’t already sold you on this dish? The leftovers are fantastic! While I love this as dinner, I almost look forward to the quick-to-heat-up + super delicious lunch leftovers for the next few days even more! In a large saucepan or skillet with deep sides, heat the olive oil over medium heat. Add the diced onion + saute for 5-8 minutes, until translucent. Add the ground sausage to the pan, + cook over medium heat, breaking up with a spatula. Saute until cooked-through, about 10 minutes. Drain off any fat. Add the tortellini, the jar of sauce, 1 jar (24 oz.) of water, frozen peas, + crushed red pepper (if using) to the pot. Bring to a boil + simmer for 15-18 minutes, stirring frequently, until the tortellini are al dente, + most of the liquid is absorbed. Add in the spinach, stir to combine, + cook for 1 minute more, until spinach is just wilted. Add more salt + pepper if needed, + serve topped with freshly-grated parmesan cheese. 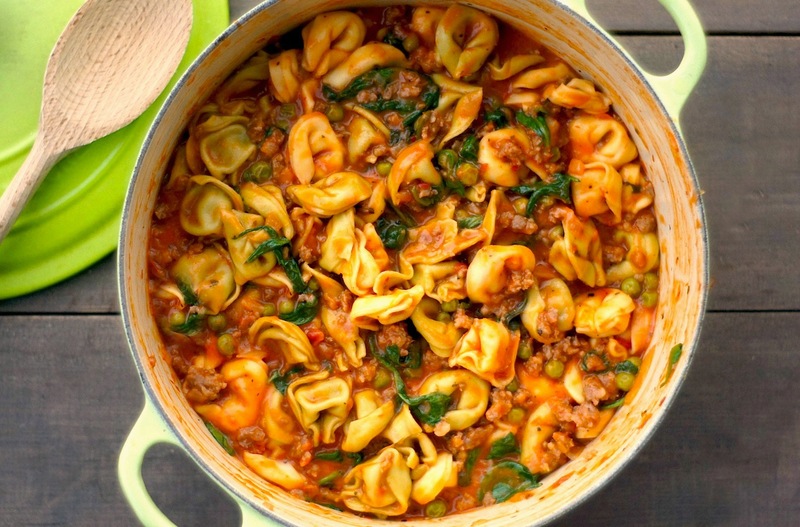 Totally with you about the advantages of one-pot dishes – this looks so tasty! Such a perfect weeknight dinner. I love a one-pot meal ever once in a while, too. This looks great, wonderful flavors! YAAY. So happy you shared the recipe. Love all the ingredients and of course, love the ease of effort (or lack thereof) to put it all together. Woohoo! Holy scrumptious, comforting goodness in a pot! You always come up with the best weeknight meals, Amy! This is brilliant and I bet so incredibly delicious. A must-try in my kitchen! I love one pot meals and this one sounds wonderful! Definitely need to add it to the menu! It doesn’t compute to me when you say “not diggin’ vodka cream sauce,” lol! I was just staring at a jar of that yesterday in Publix. Now I totally have an excuse to indulge. This looks fantastic and I’m all about some easy cleanup! Bahahaha! Agreed, vodka cream sauce is the bomb. You’ll need to grab a jar next time you’re at the store + try it! That’d be pretty tasty without the sausage! I love one-pot meals too. This one looks great! i love one dish meals too. all these flavors together must be amazing! I love this take on the usual one-pot pasta, it turns out gorgeous! This looks divine, super rich and warming! Oh yea this has definitely got to happen. I’ve got a half tub of vodka sauce that went on pizza over the weekend (yummy) and the rest will turn into a spaghetti to clean out the fridge before we leave. 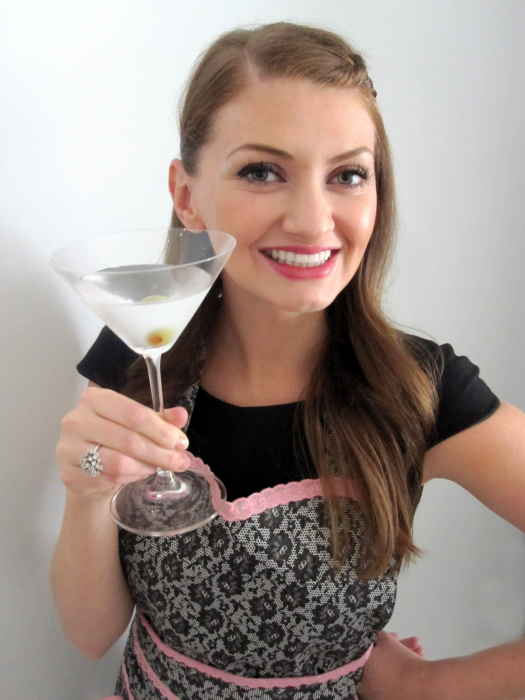 This looks so good, Amy! Omg, this was delicious! A+ Will definitely add it to my rotation. Thank you! So thrilled you liked it, Shelley!